Keanu Neal (born July 26, 1995) is an American football safety for the Atlanta Falcons of the National Football League (NFL). He played college football at the University of Florida. Neal attended South Sumter High School in Bushnell, Florida. As a senior, he had 70 tackles and had four interceptions and as a junior had 151 tackles and four interceptions. He committed to the University of Florida to play college football under head coach Will Muschamp. Neal played in all 12 games as a true freshman in 2013, recording five tackles. As a sophomore in 2014, he played in 10 games with eight starts and had 45 tackles and three interceptions. As a junior in 2015, he started 11 of 12 games, recording 96 tackles, an interception and two sacks under new head coach Jim McElwain. After the season, he entered the 2016 NFL Draft. The Atlanta Falcons selected Neal in the first round (17th overall) of the 2016 NFL Draft. He was the second safety selected in 2016 behind West Virginia's Karl Joseph (12th overall). On May 4, 2016, the Atlanta Falcons signed Neal to a fully guaranteed four-year, $10.73 million contract that includes a signing bonus of $6 million. Throughout training camp, he competed for the job as the starting strong safety after it was left vacant due to the Falcons opting not to re-sign William Moore. He competed for the job against Kemal Ishmael and Charles Godfrey. On August 25, 2016, Neal recorded five solo tackles before leaving the Falcons' 17-6 loss at the Miami Dolphins in the second quarter after sustaining an injury. Neal sustained a knee injury after receiving a stiff arm while attempting to tackle Dolphins' running back Arian Foster during a 17-yard reception. The injury required surgery and sidelined him for the first two regular season games. Head coach Dan Quinn named Neal the starting strong safety to begin the regular season, alongside free safety Ricardo Allen. He made his professional regular season debut and first career start in the Atlanta Falcons' Week 3 matchup at the New Orleans Saints and recorded four combined tackles and a pass deflection during their 45-32 victory. He made his first career tackle on the Saints' first offensive snap and tackled running back Mark Ingram Jr. after a three-yard gain. On October 23, 2016, Neal recorded a season-high 11 combined tackles (five solo) in and a pass deflection during a 26-24 loss at the Seattle Seahawks. In Week 10, he made a season-high nine solo tackles and broke up a pass in the Falcons' 24-15 loss at the Philadelphia Eagles. On December 18, 2016, Neal tied his season-high with 11 combined tackles (five solo) and had a season-high two pass deflections during their 41-13 victory against the San Francisco 49ers. He finished his rookie season in 2016 with 105 total tackles (72 solo), nine passes defended, five forced fumbles, and one fumble recovery in 14 games and 14 starts. New Falcons' defensive coordinator Marquand Manuel opted to retain Neal and Allen as the starting safety duo to begin the regular season. In Week 7, Neal recorded a season-high ten combined tackles (six solo) and deflected a pass during a 23–7 loss at the New England Patriots. In Week 9, he collected eight combined tackles and forced two fumbles in Atlanta's 20–17 loss at the Carolina Panthers. On December 24, 2016, he tied his season-high with ten combined tackles (eight solo) and a pass deflection in the Falcons' 23–13 loss at the New Orleans Saints. The following week, Neal made five combined tackles, deflected a pass, and made his first career interception off a pass by quarterback Cam Newton during a 22–10 victory against the Carolina Panthers. He finished the 2017 season with 116 combined tackles (83 solo), six pass deflections, three forced fumbles, and an interception in 16 games and 16 starts. He finished second in tackles for the Falcons, behind linebacker Deion Jones, and finished second in tackles among safeties behind Reshad Jones. The Atlanta Falcons finished third in the NFC South with a 10–6 record. They received a wild card spot, but were eliminated from the playoffs after being defeated 15–10 by the eventual Super Bowl LII Champions the Philadelphia Eagles in the NFC Divisional Round. Neal recorded six combined tackles during their loss and had 14 combined total in both playoff games. On January 22, 2018, Neal was named to his first Pro Bowl as a replacement for safety Malcolm Jenkins due to his participation in Super Bowl LII with the Eagles. During the season opener against the Philadelphia Eagles, Neal left the game with a knee injury. He came back to the game only to leave the game again on a non-contact play. The next day, it was confirmed that Neal tore his ACL, and would miss the remainder of the season. He was placed on injured reserve on September 10, 2018. On January 4, 2019, the Falcons exercised the fifth-year option on Neal's contract. Neal was named after actor Keanu Reeves. His brother, Clinton Hart, played in the NFL. Keanu Neal’s mentor is former Seattle Seahawks safety Kam Chancellor. Neal keeps a signed Chancellor jersey in his locker to pay respect. ^ "Chris Hays, The Prospector: Gators' commit Keanu Neal epitomizes the term All-American". tribunedigital-orlandosentinel. ^ "Keanu Neal 2013 Game Log". College Football at Sports-Reference.com. Retrieved December 29, 2017. ^ "Keanu Neal 2014 Game Log". College Football at Sports-Reference.com. Retrieved December 29, 2017. ^ "Keanu Neal 2015 Game Log". College Football at Sports-Reference.com. Retrieved December 29, 2017. ^ "Florida Gators' Keanu Neal a possible first-round NFL draft pick". Tampa Bay Times. ^ "Florida Gators safety Keanu Neal declares for NFL draft". ESPN.com. ^ "Florida Gators safety Keanu Neal declares for NFL Draft - Gator Bytes". ^ "NFL draft: Results, analysis for every Round 1 pick". ESPN.com. April 29, 2016. Retrieved April 29, 2016. ^ "Spotrac.com: Keanu Neal contract". Spotrac.com. Retrieved April 2, 2018. ^ Hirsh, Andrew (March 10, 2016). "Neal Impressing Falcons with Maturity". AtlantaFalcons.com. Retrieved April 2, 2018. ^ Falcons' Keanu Neal: Out 3-4 weeks. cbssports.com. August 27, 2016. Retrieved September 18, 2016. ^ "Ourlads.com: Atlanta Falcons Depth Chart: 11/01/2016". Ourlads.com. Retrieved April 2, 2017. ^ "NFL Game Center: Week 3-2016: Atlanta Falcons @ New Orleans Saints". NFL.com. Retrieved April 4, 2018. ^ Ledbetter, Orlando. Neal makes strong debut for Falcons. ajc.com. September 27, 2016. Retrieved September 29, 2016. ^ "NFL Player stats: Keanu Neal (2016)". NFL.com. Retrieved April 4, 2018. ^ "Keanu Neal 2016 Game Log". Pro-Football-Reference.com. Retrieved December 29, 2017. ^ "Keanu Neal Stats". Pro-Football-Reference.com. Retrieved December 29, 2017. ^ "NFL Game Center: Week 19-2016: Seattle Seahawks @ Atlanta Falcons". NFL.com. Retrieved April 4, 2018. ^ "2016 Atlanta Falcons Statistics & Players". Pro-Football-Reference.com. Retrieved August 6, 2017. ^ a b "NFL Player stats: Keanu Neal (2017)". NFL.com. Retrieved April 4, 2018. ^ "NFL Player stats: Keanu Neal (career)". NFL.com. Retrieved April 4, 2018. ^ McClure, Vaughn (January 22, 2018). "Falcons get another second-year player into Pro Bowl as Keanu Neal gets nod". ESPN.com. Retrieved July 21, 2018. ^ McFadden, Will (September 7, 2018). "Falcons announce Keanu Neal out for remainder of season with knee injury". AtlantaFalcons.com. Retrieved September 7, 2018. ^ Patra, Kevin (September 7, 2018). "Falcons safety Keanu Neal out for season with torn ACL". NFL.com. ^ McFadden, Will (September 10, 2018). "Falcons place Keanu Neal on IR, sign Steven Means to active roster". AtlantaFalcons.com. ^ Conway, Kelsey (January 4, 2019). "Report: Falcons will exercise Keanu Neal's fifth-year option". AtlantaFalcons.com. ^ Kirschner, Chris. Florida’s Keanu Neal named after Matrix actor Keanu Reeves. seccountry.com. February 27, 2016. Retrieved September 19, 2016. ^ "Florida recruit Keanu Neal learned from older brother's unusual career". Tampa Bay Times. ^ "Neal has competitive spirit, football blood". ^ Lewis, Derek. Keanu Neal refuses to take down signed Kam Chancellor jersey. 247sports.com. January 10, 2017. Retrieved January 22, 2018. 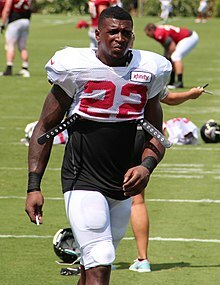 Wikimedia Commons has media related to Keanu Neal.